Corporate law is bi-vocal. On the one hand, liberating and amoral statutes permit a master narrative of business persons eagerly pursuing the good life as they see it. The mixture of such lax law and human frailty frequently leads to the unleashing of boundless ambition, vanity, avarice, duplicity, and much mischief. On the other hand, another voice in corporate law occasionally moves into the foreground to interrupt and tell its own story – a counter-narrative demanding a measure of self-restraint – when those who direct or manage company affairs press self-gain (or sloth) to the point of intolerable excess. The tellers of these stories are judges – especially Delaware’s judges – when, sitting in equity, they invoke the discourse of fiduciary duty to confront the dominant story line and reshape how corporate managers may use the vast power conferred by law.This Article argues that corporate law permits a master narrative that is highlighted and made legally visible only when challenged by equity’s counter-narrative, with which it is complicit. In unveiling discrete stories within the master narrative, Delaware’s judges tell (after listening to) the tale of other protagonists – the “saints and sinners” described by Edward Rock – and then offer their own assessment of those accounts. Many of these appraisals are written in normatively saturated and judgmental language that, in tone and words, resemble sermons and parables. The problem in corporate law, however, is not in the genre of telling but in the genre of retelling, because these sermons and parables lose their cautionary and inhibitory force if they are not properly retold. If corporate law homilies are read only by lawyers or if, in being recounted to business persons, their moral flavor is drained in favor of discerning the “rule” or “best practice,” then equity’s co-telling role in the overall story is once again, as at the outset, subdued by law.To see that this may be happening in corporate law, this Article draws on a biblical narrative where the New Testament’s redemptive teachings, for the most part, are conveyed by didactic parables and sermons emphasizing overarching principles and standards, not detailed rules or codes of conduct. Critically, moreover, apostles were exhorted not to keep the stories to themselves. Rather, they were commissioned to go forth and re-tell the Good News to the whole world. The New Testament’s Epistles – especially the Pauline Epistles –carry the news out into the broader community and explain its meaning for everyday communal life, while retaining its pervasive moral tenor.In a parallel way, equity’s co-producing role in corporate law is redemptive, and Delaware’s chancellors frequently preach and teach in parables and sermons. In response to law’s tale of unbridled freedom, they speak of restraint. Moral drama arises from this clash. This is seen in Chancellor William Chandler’s memorable opinion in the high-profile Disney case of 2005. Unlike the retellers of the biblical gospel, however, the “apostles” of corporate law – the elite corporate bar – frequently screen out the moral tone when writing their “epistles” about Disney, as seen in twelve sample letters. By contrast, newspaper accounts do a far better job of preserving and transmitting the moral fervor of the Chancellor’s judicial sermon.It is concluded that to maintain narrative balance in the two-fold design of corporate law, the very freedom to pursue the master narrative made possible by slack statutes depends on equity’s moral sensibility and counter-narrative being fully retold to business actors. Originally published in 2009 MICH.ST.L.REV. 847. Lyman P.Q. 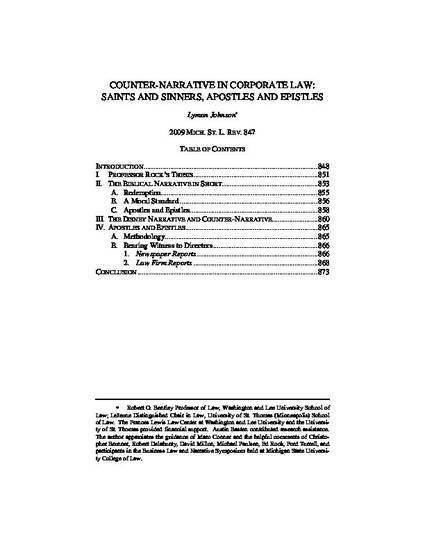 Johnson, Counter-narrative in corporate law: saints and sinners, apostles and epistles, 2009 Mich. St. L. Rev. 847 (2009).